Your Edmond home base awaits at this newly remodeled 3-bedroom, 2-bath vacation rental home. Boasting over 1,700 square feet of beautifully appointed living space, a family or group of up to 6 guests will feel more than comfortable with all the amenities of home. Venture out to nearby Oklahoma City for an exciting day full of shopping, dining, and other attractions before returning to this welcoming abode. 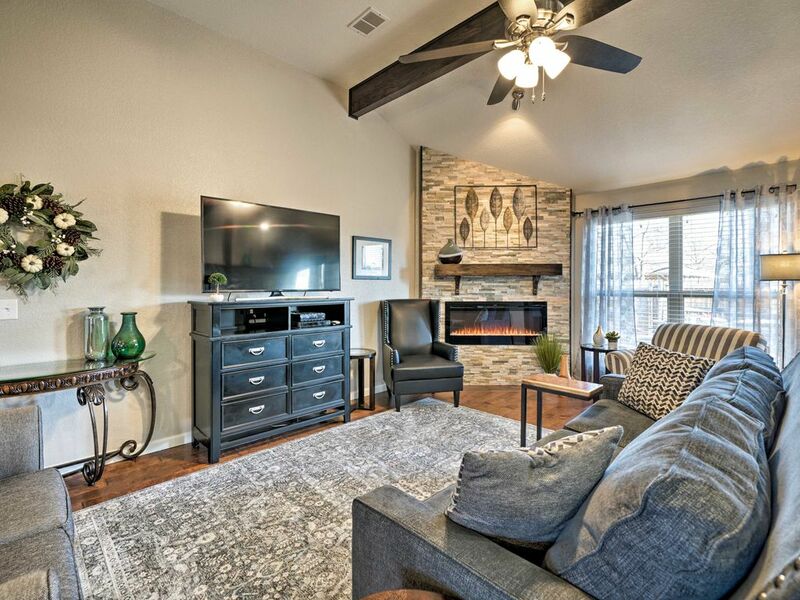 Relax by the electric fireplace while the Thunder game plays on the flat-screen Smart TV! Feel right at home in Edmond the moment you set foot inside this beautifully-appointed single-family house. You'll look forward to returning to this welcoming abode after each adventure. The open floor plan features contemporary decor and furnishings throughout. Relax in the living area as a movie plays on the flat-screen cable TV and turn on the electric fireplace for a cozy ambiance. Grab a seat at the bartop or set the elegant dining table to share a home-cooked feast. The fully equipped kitchen features stainless steel appliances and sleek granite countertops. The backyard offers a great setup for those warmer days and is complete with a gas grill, patio table, and plenty of seating for your group. You'll even find a playground and adult swing chair! When bedtime approaches, choose from one of the 3 well-appointed bedrooms. The master bedroom features a king-sized bed, flat-screen cable TV, and a spacious en-suite bathroom with double vanities. Oklahoma City is just a short drive away, where you'll find excellent shopping, dining, popular attractions and more. In Oklahoma City, you will find attractions such as the Cox Convention Center, Botanical Gardens, Oklahoma Museum of Art, and the Bricktown River Walk. Don't miss out on a basketball game at the Chesapeake Energy Arena! After you cheer on the Thunder, grab a bite to eat downtown before heading back home. This property was absolutely perfect for our family. It had everything we needed and the host was extremely helpful and attentive. A Great house that has just about everything you need. The house is very nice and is well equipped. The kitchen is well designed and is stocked to meet your cooking needs. The backyard is spacious and has a playset for kids and a patio with a grill. The owners are very attentive and make sure your stay is successful. This property is absolutely beautiful! It is super stylish, yet also comfortable and feels very homey. The granite is gorgeous and decor extremely tasteful. The owner has considered and provided every possible travel amentity. It is an amazing home away from home! Amazing rental! Beautiful, spacious, & modern! What an amazing property. We arrived with 13 people and there were beautifully apportioned bed rooms for us all. Nobody had to sacrifice on luxurious bedding and nice furniture. The decor is modern and fresh, with much more room to sit and hang out with our family than we expected. We had 7 adults and 6 teenagers and thoroughly enjoyed the living room, dining room, and kitchen space to hang out and be together. The younger kids and the dogs appreciated the backyard with a large, furnished patio and play structure. The kitchen is spacious and was comfortable for several adults to prepare dinner together. This property provided everything we needed and more, and I was so appreciative of the opportunity we had to be together in a clean and relaxing home. The decor is beautiful and spa-like, the bathrooms and kitchen are very well stocked with everything we needed, including a laundry room! I highly recommend this property. The owner was so responsive and accommodating, the house was impeccably clean, and the home is beautifully decorated. I will stay here again the next time we visit family in town. Recently we visited our son in Edmund OK and had the opportunity to stay at this Air BNB near his home. We were bringing our dog and needed a place that was pet friendly. We were amazed at the extensive amenities. Our temporary home had a fenced back yard and Carol, our hostess, had provided dog toys for Major. There were fresh flowers, cold drinks, cheese and crackers, and even microwave popcorn. The kitchen had beautiful modern appliances including a toaster, a Keurig and a regular coffeemaker. There was an extensive selection of cookware and utensils in addition to dishware and silverware; in short everything one would need in a well furnished kitchen. Moreover there were coffee, creamer, condiments and microwave popcorn. There was a unique bistro table in the kitchen which was clearly handmade. The kitchen, dining and living areas are all combined creating a spacious feel. The electric fireplace in the living area is a focal point that complements the really comfortable furnishings which include a handmade live edge coffee table. The dining table is beautiful and is large enough to seat at least eight. When we arrived it was set with tableware and napkins. The beds are as comfortable as those at home and the bathrooms were unique, spotless and stocked with linens and all necessary amenities. Everything was spotless and the TV with DirecTV and Wifi provided ample entertainment. Carol is a gifted and attentive hostess. We felt as if we were home, and will definitely stay here on our next visit.